This problem continued for me until I discovered Will Leavitt’s book, A Modern Method For Guitar. In this master work, the author breaks down a total of nine different fingerings for each scale. After working through the books, I found myself completely able to find my way around a scale anywhere on the neck and easily select the next scale shape for whatever chord was upcoming. 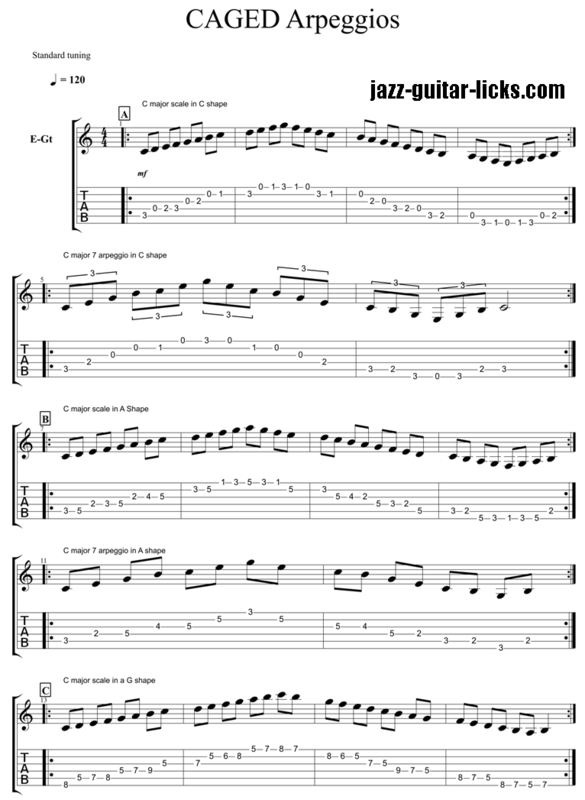 His method is an advanced application of the idea that we can move common open triad shapes (cowboy chords) up the fretboard and build scales, arpeggios and chords voicings around each. This concept is commonly called the CAGED method. For those unfamiliar with CAGED, we start by playing the open chords C-A-G-E-D that spell out the word CAGED (CAGED Scales Example A). In the key of C, we will travel horizontally up the neck, placing each voicing in the word CAGED on each pitch subsequent C we find. For instance, an A chord, having a root on the fifth string, will fit at the third fret of the fifth string. The G, having a root on the sixth string, will fit at the C on the eighth fret of the sixth string, giving us a shape in fifth position. And so on, until we come back to C shape an octave above where we began. From here, we will beginning building scales that fit around each shape (CAGED Scales Examples B-F). Each chord shape has multiple scale shapes we could use, but I have limited it to one per chord for the sake of simplicity. I suggest you do the same initially. Each pattern encompasses what the hand would naturally be able to access by only shifting the outside fingers up or down one fret. Now we have effectively built scale shapes that are organized relative to musical and physiological structures as opposed to the construction of the fretboard. The first benefit of this approach is that we have a major scale shape we can apply at any position on the neck. Now when confronted with difficult chord progressions our hand won’t have to jump up and down the fretboard to whichever of the two E and A-root scale shapes we can recall first. We can (with practice) visualize and shift to the next scale pattern seamlessly while staying in position. 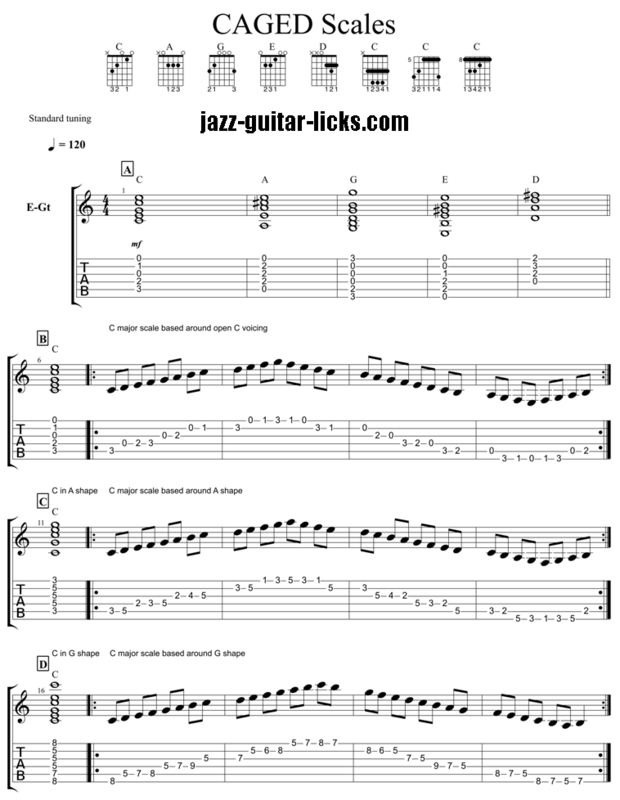 One way I recommend practicing this is running scales up and down over a chord progression or tune while remaining in one position or area of the fretboard. This approach can be further applied to other structures. By isolating the chord tones of a major 7 voicing from each scale pattern we can construct arpeggio shapes that are wedded to each scale within our mind and hands (CAGED arpeggios Examples A-E). This an invaluable concept to master. Not only will be able be able to shift between arpeggios and scales smoothly, we will be aware whether any given not we are playing is a chord tone or tension. 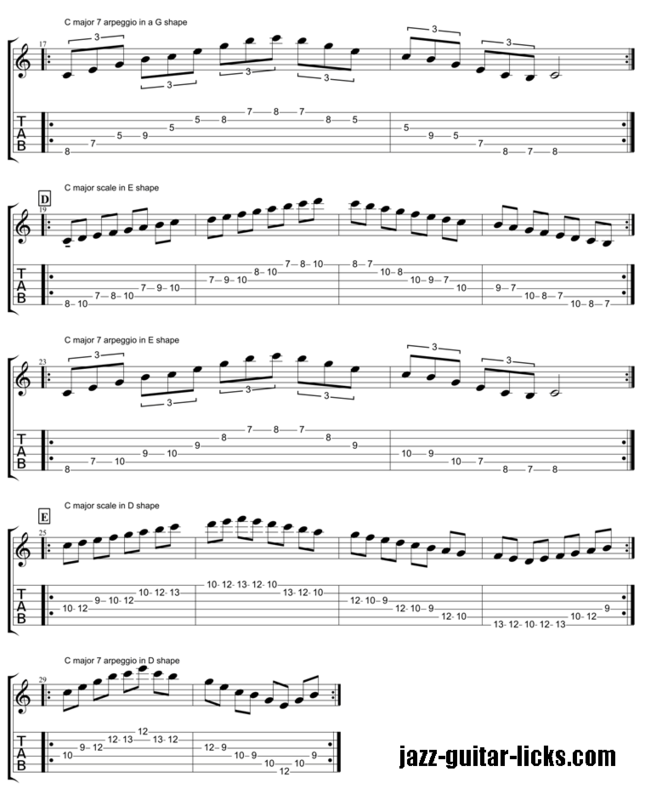 To best acquire this skill, I recommend practicing each scale and corresponding arpeggio shape consecutively. Once we have our arpeggios in hand, we can begin to mine chord voicings from each shape. 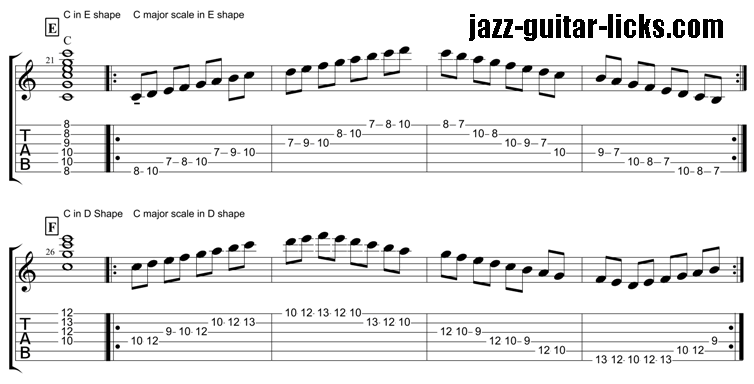 This pays huge dividends when it comes to improvising in a solo guitar format. 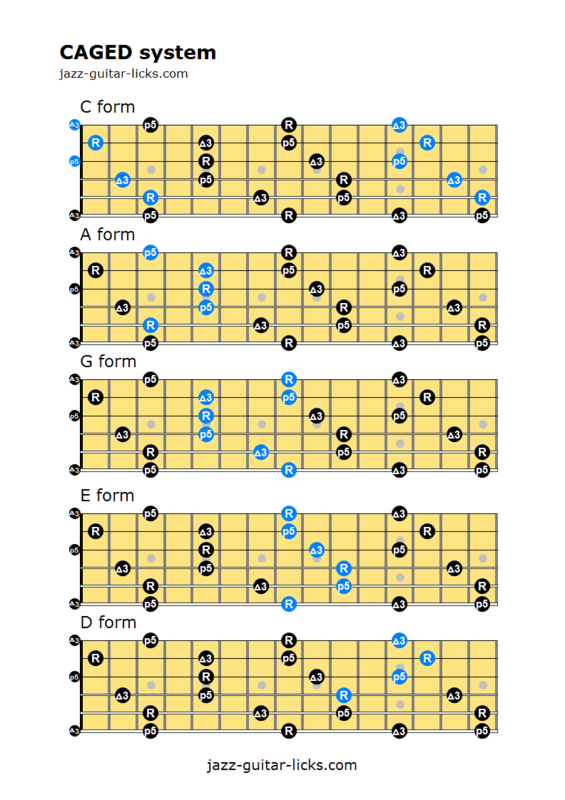 There are a variety of chord that fit in each scale shape, but for our purposes here we will limit ourselves to the Drop 3 voicings that fall on 5th-2nd string (CAGED Chords Examples A-E). As we progress through the inversions, we see there is a corresponding scale shape for each. Admittedly, the E pattern does not contain a Drop 3 voicing on this string set (Example D), but we will fit in a root position Drop 2 from the E string to bridge the gap. To internalize this relationship, I recommend starting the scale at the lowest note in chord voicing by striking the chord (CAGED Chords Example F). As you ascend and descend the scale, when passing through a pitch encompassed in the chord voicing, attack the chord voicing in lieu of the pitch itself. This gives one all the options for where an improvised line can be intersected, begun or ended on a chord voicing. I’ve also found this tactic helpful in sight reading. If one begins by checking the key signature, it can be determined from which major scale the piece is likely derived. By next selecting a scale shape which includes both the highest and lowest pitch in a given piece, one insures their hand will be in a position to grasp any pitch in the piece. Even non-diatonic notes falling a half-step above or below any scale notes will be simple to locate as we are aware to which diatonic pitches they are adjacent. For pieces with especially large ranges, we can shift between two or even three adjacent scale shapes. 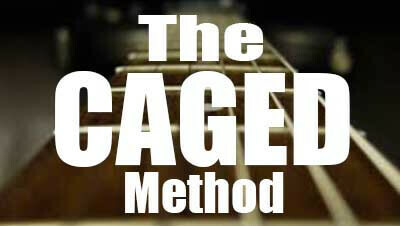 The CAGED method is not limited to major scale usage as it can be applied to any scale or mode. After learning of its benefits, I have personally applied this approach to every scale and mode I encounter. Over time, I began to feel comfortable improvising and comping any set of changes over any position on the fretboard. This is the approach I now teach and emphasize to my students regardless of the style they are pursuing because in CAGED the fretboard is organized around musical structures rather than organizing musical structures around the fretboard. Try applying it to any scales you might be learning and see if it brings new levels to your playing. 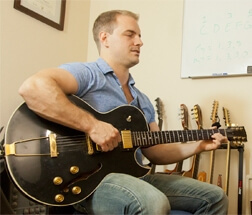 Chris Primeau is a guitar teacher based out of Austin, Texas. You can learn more about him at his Austin Guitar Lessons page. 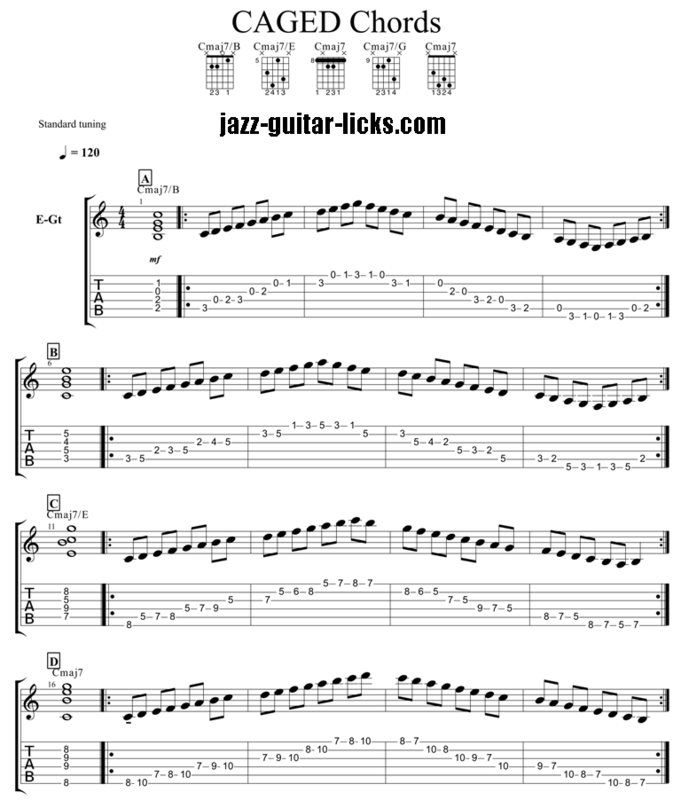 Guest post lesson providing useful tricks and tips on how to jazz up your blues on guitar.